Despite humorously coming out to the Goosebumps theme tune, MUNA’s Halloween show in London was anything but a fright fest. Kicking their biggest headlining show in London off with the jittery guitar melodies of “Promise,” the LA three-piece did major justice to every song from their debut album About U (minus the tempestuous “After”) plus exuberant new cut “In My Way.” Main vocalist Katie Gavin refused to miss a note or a mood, despite a case of the giggles while revealing the touching context of “If U Love Me Now” amongst some playful teasing from band mates Josette Maskin and Naomi McPherson (a glimmer of the affectionate bond the three clearly share). The thumping pop beats of “End of Desire” were traded in for a sombre acoustic sound, breathing new life into the bop. The trio also put the MUNA Spin on two covers (U2‘s “With or Without U” and Stevie Nicks‘s “Edge of Seventeen”) and, true to the show’s Halloween theme, performed “Thriller” as an encore, complete with Josette theatrically reciting Vincent Price‘s speech (albeit from her iPhone, much to Katie‘s amusement). Something that become undeniably apparent as the show unfolded was the shining star quality (not that all three of the girls don’t shine in their own way) possessed by Naomi – one that isn’t necessarily obvious just by listening to the album. The sweet and seemingly shy member of the band is credited as “rhythm guitar/synths/production” in MUNA‘s official bio, but the girl can also sing. Taking over from Katie to perform the cathartic “Outro,” Naomi utterly slayed the song with her honeyed yet powerhouse voice. Naomi is outrageously talented, and definitely needs more leads on recorded releases in the future. Katie shared a brief anecdote before playing “Crying on the Bathroom Floor,” the band’s gripping tale of the aftermath of abusive love (which features the most iconic intro to a song ever btw). Katie decided that she didn’t actually want the song included on About U, in case the intimate lyrics made her appear too vulnerable or weak. She then went on to reiterate how important “Crying on the Bathroom Floor” has become; in today’s world, even going to a concert is an act of bravery and that the band believe “it is brave to make yourselves vulnerable.” It was a beautiful, heartfelt insight into the inner mentality of the band, who seem to genuinely care about the positive impact of their 80s-tinged gothpop music on their fans and the world around them. This sentiment sparkled again in MUNA‘s exhilarating closing performance of “I Know a Place,” their uplifting anthem exploring the imperative need for safety in the LGBTQ community, which had even the security guards beaming and bopping; “this is their best song,” somebody in the crowd murmured. 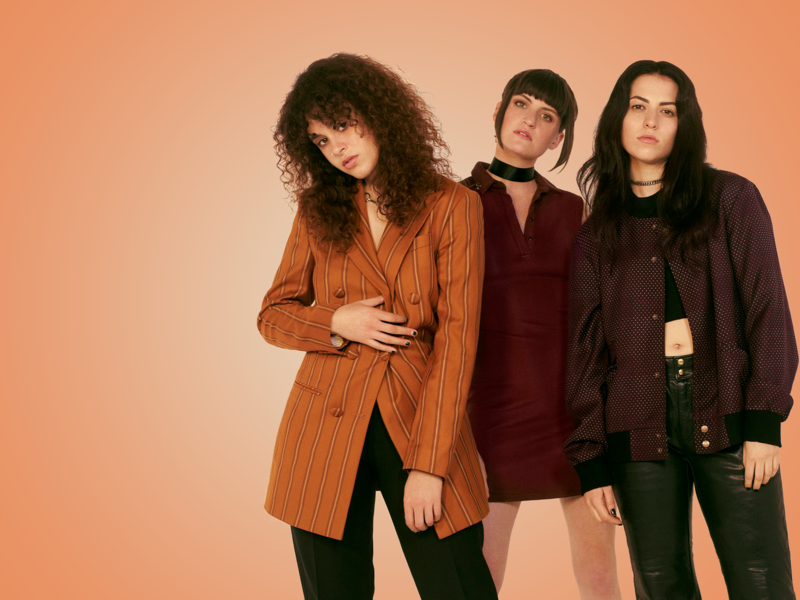 Before bursting into the song, Katie enthused about MUNA‘s ethos of creating safe spaces with their shows for their predominantly queer audience – a declaration met by roars from the costume clad crowd. “We’re in Heaven after all,” Katie reminded everybody. There’s “a few bad things” the MUNA girls might have done (“that nobody made me doooooOOooOO“) but performing flawless music is definitely not one of those bad things.